The Pixma TS5050 is Canon’s latest addition from the home colour multifunction peripheral range. The attractively squat design and curved edges make it visually attractive. This compact printer, weighing 5.5kg has the dimensions of 12.6 x 37.2 x 31.5 cm. The printer is versatile and is best suitable for printing, scanning, and copying of the documents or pictures. The printer is complemented by an LCD display of 3 inches, which make it easy to visualize the navigation. To add more feasibility, Pixma TS5050 printer comes with built-in Wi-Fi. Now one does not have to come near the printer and take prints. Moreover, the canon print app is the cherry on the top to make your printing task easy by taking the prints from wherever you are. You can easily save the document or picture for future use, by scanning them. The printer provides high scanning resolution of 2400 x 1200 dpi with auto-adjusting colour contrast feature. The printer yields high-quality prints, thanks to high standard Canon Pixma TS5050 ink cartridges. The printer provides high printing resolution of 4800 x 1200 dpi and also support borderless printing. This printer works well with the system having Window and Mac OS. This printer is suitable for all types of printing- from pin-sharp text documents to stunning photos. 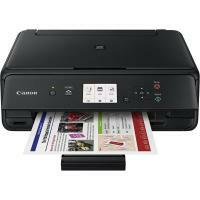 Canon Pixma TS5050 printer is a compact versatile printer. With wireless connectivity and cloud printing in Pixma TS5050 printer, the printing task is no more a burden. The printer LCD display, allows easy navigation while printing from SD card or during copying/ scanning of the document. If cost is not an issue, then this printer is appropriate for the home, small office or for a small digital studio. What are the steps for replacing Canon Pixma TS5050 ink cartridges? Step 1. Turn on the power. Step 2. Open the scanning unit. Move the printhead holder to the replacement position. Make sure that you do not touch the print head holder until it stops completely. Step 3. Remove the Canon Pixma TS5050 ink cartridges with the lamp flashing fast. Push the tab and lift the ink tank to remove it. Do not touch other parts besides the ink cartridges. Handle them carefully to avoid staining of clothing or on the surrounding area. Dispose off the empty ink cartridges at a proper place. Note: Do not remove two or more ink cartridges at the same time. Be sure to replace the cartridges one by one while carrying out the replacement procedure. Step 4. Take a new cartridge out of its package, remove the orange tape completely, then remove the protective film present inside it completely. Handle the Canon Pixma TS5050 ink cartridges carefully. Do not apply excessive pressure to it. If the orange tape remains, ink might splash and the printer will not able to print properly. Step 5. Hold the cartridge with the orange protective cap pointing up in the direction while being careful not to block the Y-shape air hole. Step 6. Lift the tab on the orange protective cap to remove it off gently. Ensure to not push the sides of the cartridges. If you push the sides, an ink may splash. Make sure to not touch inside the orange protective cap. The ink may stain. Step 7. Insert the front end of the ink tank into the print head at a slant. Ensure that the position of the Canon Pixma TS5050 ink cartridges matches the label. Step 8. Press on the top of the cartridges until it snaps firmly into place. Make sure that the ink lamp lights up. Important: You might not able to print if the cartridges are installed in the wrong position. Be sure to install all the cartridges in the correct position. Step 9. Close the scanning unit cover firmly. Select OK if a message is displayed on the LCD. Once you start printing after replacing the cartridges, the printer will start cleaning the print head automatically. Do not perform any other operations until the printer completes the cleaning process. Q. What is the page yield of the compatible Canon Pixma TS5050 ink cartridges mentioned on your website? A. The compatible Canon Pixma TS5050 ink cartridges displayed on our website are XL ink cartridges that have a higher page yield than the standard ink cartridges. The pigment black ink cartridge (PGI-570XL) can print up to 500 pages, the dye black ink cartridge (CLI-571XL) can print up to 895 pages, the grey ink cartridge is capable of printing up to 280 pages, and the coloured ink cartridges can print up to 650 pages without having to be replaced. Q. I have been advised to perform a printhead cleaning to improve the printing quality. However, the ink levels of my Canon Pixma TS5050 ink cartridges are low. Should I go ahead with the printhead cleaning? A. Do not perform a printhead clean when the ink levels of the cartridges are running low. This is because the printhead uses some amounts of ink for cleaning and insufficient ink can cause damage to your printer. You can either wait for the ink cartridges to run out or replace the ink cartridges immediately to perform a printhead clean for your printer. Q. How many pages can Canon Pixma TS5050 printers handle at one time? A. Canon Pixma TS5050 can handle a maximum of 100 sheets of paper at one time. Q. I previously had some bad experiences while using compatible ink cartridges from other companies with my printer. Can you assure me that I will face no issues when using your compatible Canon Pixma TS5050 ink cartridges with my printer? A. Yes, we assure you that using our compatible ink cartridges with your printers will cause no problems or damages. All our compatible cartridges are FSC tested and certified so as to work well with your printer. If you face any issues when using our compatible ink cartridges, please feel free to contact our customer service for support.